Today’s technology and its ease of use dominates the online stage with its content, convenience and the ability to connect to people across the world. This connectivity to reach out to people can be achieved by a simple few clicks. However, the more invested we become with the online world and the ability to jot down our thoughts instantaneously, the less we feel the need to document our content on paper. That’s where PaperLess for Sage comes into its own. I am, or as you will read is this blog, was a fan of the good old-fashioned pen and paper. I am referring in the past tense, as I am now converted. I used to think that it made me more organised, having everything written down made it visible. On reflection, I was merely duplicating my workload. However, being in a paperless office which has been touched on in previous blogs, here at itas we adopt a clean desk policy and encourage efficiency in the workplace. I’ve adapted to this way of working, which seems to be that less paper really is more. At the end of the day, we are all reluctant to change in some way, shape or form. However, we need to accept that change is inevitable. If there is a solution out there that’s going to save me time and improve efficiency then why wouldn’t I embrace it? It’s a win, win situation for both myself and the team at itas. So, I’ve embraced change and adopted a paperless mentality throughout my working day. It gives me more freedom to focus on what matters for the business. It allows me to focus on what I do best. What’s not to like?! The key is in the name of PaperLess. Simple in name and advanced in it’s technology. It equips Sage with an innovative and efficient software solution. The emphasis needs to be on the capital L, the software essentially allows you to use less paper. Paperless is a document recognition software that uses OCR (Optical Character Recognition) technology to automatically read invoices and receipts. This allows you to drag and drop PDF documents as and when you receive them into Paperless and let it work its magic. Alternatively, you can allow Paperless to automatically read documents like Purchase Invoices that you receive via email and import the information from that document into Sage 200cloud. Paperless is intelligent in that it can be trained to pick up common recurrences in invoices sent over from your suppliers. This is done through the mapping wizard, ensuring the system picks up as many of the important fields as possible on the invoice. You may have to manually do this a few times but once you set these mappings up once, they’re there for good! If for whatever reason Paperless cannot pick up the information automatically, users can simply key in the correct info in Paperless then send this through the system. PaperLess eliminates the laborious and often daunting task of completing “paperwork”. It significantly reduces the margin for error which ticks the boxes from a compliance perspective. A bonus feature of PaperLess that I personally am fond in a consultancy role, is the ability to be able to have an app on my phone. The app enables me to scan and upload invoices and expenses on the go. This app and the simplicity of the process saves me more time than I realised. When out and about on the road, visiting both existing and prospective customers – maybe stopping off at a service station for the well deserved half way point coffee is a must! 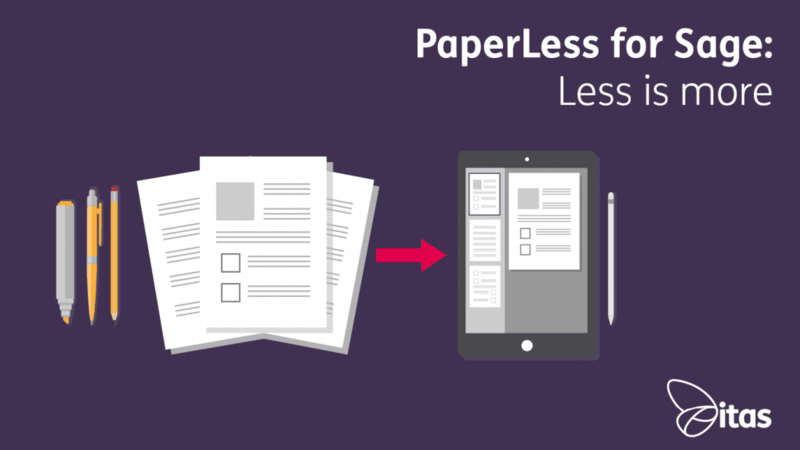 Submitting an expense with the help of PaperLess has never been easier. Long gone are the days where I need to retain the receipt. We all know the receipt has seen better days when it returns to the office! Now, I simply pay on my phone with contactless and scan the transaction via PaperLess directly into Sage. Time savvy solutions like this feature prevent an inevitable headache that both myself and the Accounts department get or should I rephrase got at month end when expenses are due in. Points for efficiency for all, and some more time to focus on what you can do best. As Halloween and Bonfire Night have now been and gone, it pretty much ends Autumn. Christmas is well and truly upon us with less than five weeks to go! This year, thanks to PaperLess I’ll have all my invoices scanned and recognised in Sage and filed away ready. For the Christmas shutdown this year there won’t be paper in site. I’ll also be on top of my expenses with any last minute additions submitted via the mobile app to help me with the Christmas spends! So, am I really converted and ready to embrace becoming paperless? What’s clear is that the office environment is embracing change across many spectrums. When it comes to paper in the office, the only paper that will be evident in the itas office will be the wrapping paper when we all open our office Secret Santa presents! This year, leave the paper at home for the Christmas presents. For the office, take a look at the PaperLess alternative. You may see as I have done that less paper is more.